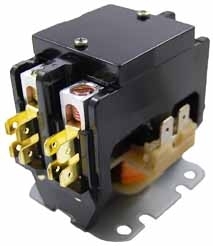 Click the button below to add the Packard C240B 2 Pole 40 Amps 120 volt Coil Contactor to your wish list. In accordance with U.L. Bulletin No. 508 ?Industrial Control Equipment?, contactors meet specifications for devices up to 600 VAC. Coils have class B insulation. Includes Lug, spade terminals, and covers.